I'm very happy to welcome Steve Marantz to A Blue Million Books today. Steve is the author of the non-fiction book Next Up At Fenway, just recently published by Inkwater Press. "Through the story of Marcos Baez and Fenway High, Steve Marantz shows the humanity and prospects of Latino student in our nation’s public schools. Next Up at Fenway gives us a window into how social forces and education policy decisions are playing out in real people’s lives -- for better and worse -- within America’s fastest growing demographic. This book is both Americana and a reality check for the 21st century.” - Sonia Chang-Diaz, Massachusetts state senator and former teacher. Steve, you've been a reporter, and now you're a researcher at ESPN. How long have you been writing, and how did you start? For about 40 years now. I got a journalism degree from the University of Missouri and worked as a newspaper reporter. 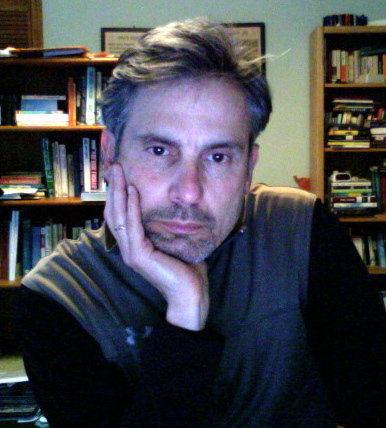 About ten years ago I switched to television, with ESPN, and continued my writing with books. Next Up at Fenway is my third. Tell us about Next Up At Fenway. 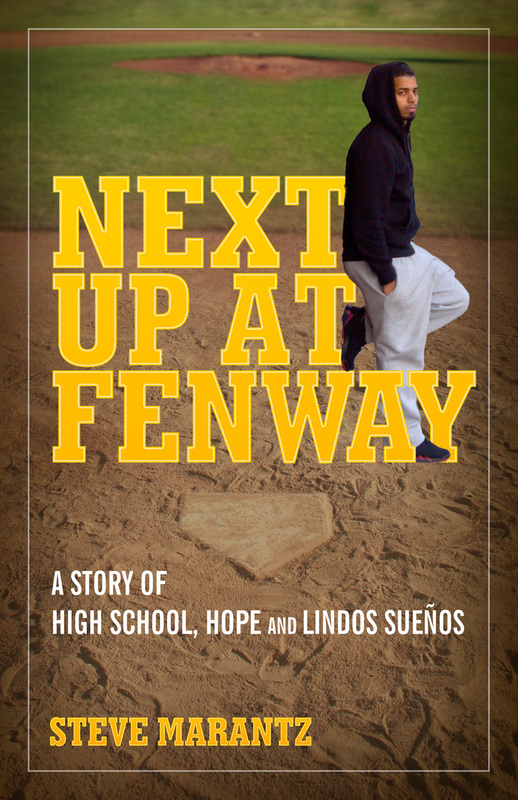 Next Up tells the true story of Marcos Baez, whose public high school next to Fenway Park was his best hope for a college education and a better life. Baez, the son of a single mother of Puerto Rican descent, personifies the struggle and determination of America's fastest-growing demographic. Recognized as one of two Boston high schools "where Latinos succeed" by the Mauricio Gaston Institute of the University of Massachusetts-Boston, Fenway High teaches critical thinking and community involvement in a familial environment. Through its innovative curriculum and Latino-sensitive culture, the school helps Latino students succeed academically and in personal development. Inspired by this educational model, his teachers, and the Red Sox Foundation’s Lindos Sueños program that sent him to the Dominican Republic for training and community service, Baez works toward his goal of college. Few adults want to go back to high school, yet you did, in a manner of speaking, for two years. What was the experience like? Fun - to be around so much youthful energy. Encouraging - to see how hard these kids worked. Humbling - to see how far education has come since my high school days. My high school, Omaha Central, was considered top-notch in its day, but it offered little of the innovation I saw at Fenway. What was the toughest aspect of writing Next Up At Fenway? Focusing the story. There were so many directions I could have taken it, so many strong characters, so many themes. I had to pick, and narrow it down. I’m a firm believer that a story that tries to do too much ends up doing too little. How did you come up with the title Next Up At Fenway? It seemed to fit, since the story is about upward mobility. Just under 70 percent of Fenway’s students live at or below the poverty line. For what age group is this book intended? High school-aged readers on up. Tell us about your "day job." I am a researcher for the ESPN E:60 show. It is a news magazine show with long-form storytelling, human interest and investigative stories. My job is to support the producers in whatever their needs are. It enables me to work at home four days a week, which frees me up to work on books in my spare time. Quick read. Fun. Provocative. Inspirational. Where America is heading - we hope. I live in the Boston area - it was accessible to me. It was original - nobody had done it. It was relevant - education and Latino culture are on America’s front burner. It was fun - a high school next to Fenway Park. How cool is that? Very cool. What do you hope others will get from reading Next Up At Fenway? Pleasure. Hope and inspiration. Empathy. And maybe some ideas to apply to public schools everywhere and anywhere. Do you outline or write by the seat of your pants? Outline. A narrative needs to follow a few effective principles. I love the image of Marcos at the ‘Lindos Suenos’ camp in the Domincan Republic, indignant at the behavior of his fellow American non-Latino teenagers, and provoked enough to write the opening lines in his college application essay. Tom Wolfe, Frank Rich, Larry McMurtry, James M. Cain, Raymond Chandler, J.R.R. Tolkien, Jane Mayer, Elizabeth Kolbert, Malcolm Gladwell. Which author would you most like to invite to dinner, and what would you fix him? Tolkien. I would fix him whatever he wanted. And ask him what the heck he was smoking. Alan Huffman and Michael Rejebian. Paperback. Morning. Before my brain is fried. You’re given the day off, and you can do anything but write. What would you do? Golf. 36 holes if possible. Swampscott, Ma. It’s got Vinnan Square and Red Rock Bistro. Just about everything a person needs. read recently and would recommend? 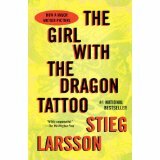 Stieg Larsson’s the Millennium trilogy. Tremendous. Made me want to see Sweden. Omaha would be cool. But I’m happy in Swampscott. Everything is here. Omaha? Seriously? What are you working on now? A vegetable and cheese omelet. Always a wise guy. Thanks for being here, Steve! Steve Marantz is a researcher/producer for the ESPN E:60 show and a former reporter in government, politics and sports for the Boston Globe and Boston Herald. 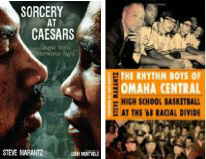 His last book, The Rhythm Boys of Omaha Central: High School Basketball at the ’68 Racial Divide, won the ForeWord Reviews gold medal for non-fiction sports, and the Nebraska Center for the Book award for non-fiction history. He also authored Sorcery at Caesars: Sugar Ray’s Marvelous Fight. Marantz lives in Swampscott, Mass., with his wife, Alison Arnett, and their dog, Arthur.